If you are in need of professional drywall installation services for your industrial or commercial building, you’ll be faced with a number of different choices in terms of layout, style, and texture. Each decision will have far-reaching consequences within your facility, including the daily aesthetic enjoyment of the walls. Installing drywall is an intensive process, relying on skilled hands and reliable practices to provide consistent results. One major choice comes in the form of which texture you would like to adorn your building. Each choice holds its own unique set of benefits and drawbacks, and implementing that texture can require a skilled hand. Any property manager or business owner in need of experienced drywall contractors in the Chicago area can benefit from working with AZ Drywall Finishing. Our drywall company, based out of River Grove, has worked to provide amazing results for each and every client since 1999. Nobody delivers drywall services centered around quality and customer satisfaction as us, as our industrial drywall finishers work to raise the standard. Today, we’ll highlight the pros and cons of today’s three most common drywall textures. If you’re in need of an industrial drywall company, be sure to reach out to us afterwards for a quote on your project! This drywall finish used to be a very common site across the country, yet today’s trends have seen this texture start to decline. Property owners can benefit from the convenience and ease of installation of popcorn textures. This application relies on solid particles (like styrofoam) to provide definition on your walls, making popcorn textures unique in the industry. Customers generally have three different particle size options to create different looks. Historically, this material was used in a variety of applications because it requires very minimal drywall finishing efforts for a quality outcome. The unique pattern of popcorn texture is also helpful for hiding a wide range of mistakes or aesthetic shortcomings, making popcorn ceilings popular for use nationwide. Business and homeowners in need of a helpful sound buffer between floors also relied on popcorn ceiling texture for its acoustical benefits as well. While a popular choice of the past, the last decade has seen a marked decrease of popcorn ceiling applications. Modern trends have negated the need for this product, as many drywall finishers have focused on either implementing modern textures or leaving the ceilings smooth. Chances are that you have seen orange peel textures adorning walls everywhere in your life, as this option has been a popular choice for decades. Numerous styles have come and gone over the decades, yet this texture remains as a solid choice. Orange peel is aptly named because the finished texture looks exactly like what the moniker entails. Homes and businesses can benefit from orange peel, as this texture is durable and easy to clean. Orange peel can also explain its popularity because of how easy it is to install. Mixing your compound with plentiful water and attaching it to your hopper and compressor will result in an attractive texture that requires little to no additional work. DIYers have found great success in purchasing pre-mixed bottles for quick, easy, beautiful results. Orange peel has been in wide use for years, making it a very common site across millions of homes and businesses. This popular texture choice relies on the use of a textured plaster to create a luxurious look. The skip trowel technique has been in use since the olden days and relies on different materials for different results. Sand is one common option that can help to take your drywall finish to the next level. Skip trowel designs are often used in high-end projects, requiring skill and patience to create an amazing result. People do mention, though, that the skip trowel technique is much more forgiving than textures such as knockdown. In many cases, skip trowel is more affordable and requires less time to accomplish. This approach is becoming a popular alternative to popcorn textures as well, as homeowners and property managers are on the lookout for quality ceiling textures. Many people rely on this texture to add a layer of quality to their walls. Unlike skip trowel, which relies on more spacing to create a lighter texture, knockdown relies on droplets of material to cover a majority of the drywall surface. Drywall finishers can choose between different densities to customize how the finished product looks. You simply spray a certain density on the walls with the intention of leaving the original surface revealed to create depth. Once the droplets are applied to the wall, a knockdown knife is used to simply knock the material down, creating a smooth finish that contrasts nicely with the smooth wall beneath it. Knockdown texture has been in use for years and is now very commonly used in newer construction projects. Modern trends and technology have made this premium texture more popular than ever for any level of use. Knockdown is often cited as the true replacement for popcorn ceiling options, with many DIYers painting before application to create a dynamic finish. 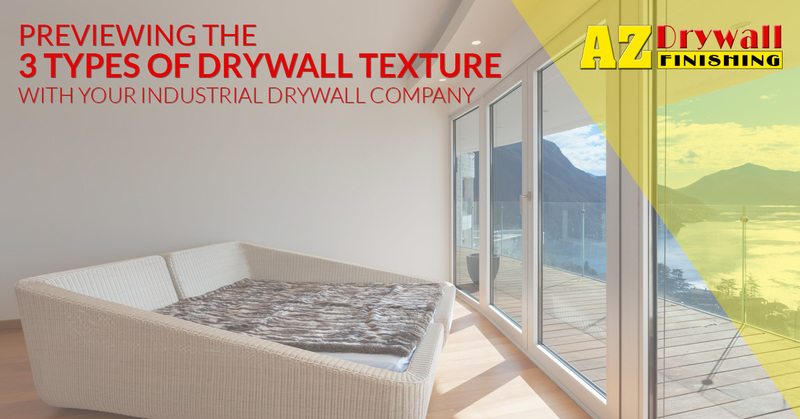 Deciding what style of drywall texture to utilize in your building can be a challenge, especially if you are trying to match the rest of the walls. AZ Drywall Finishing is here to help you every step of the way! Our experienced team of drywall contractors in Chicago have the skills and equipment needed to create outstanding results for your project. From installing drywall and acoustic tiles to metal stud framing and wall finishing, our contractors have what it takes to get the job done on time and on budget. If you are looking for an industrial drywall company for your building, be sure to contact us today for a quote!